BoJaB: No response from the cache owner to the previous reviewer temp disable log. I am archiving this listing. Located on the east side of the University of Central Florida campus in Orlando, the 82 acre Arboretum includes seven distinct native plant communities representative of Central Florida's diverse natural ecosystem. 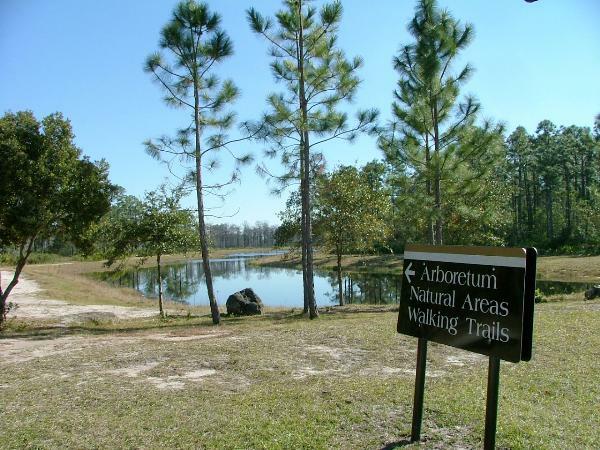 At the Arboretum, you will visit various habitats including a pond pine community, a mixed hardwood hammock, an ephemeral pond, an oak hammock, a sand scrub, a cypress dome, all mixed in a pine flatwood matrix. One of the things to notice as you travel through these ecosystems is the subtle changes in elevation or height. The smallest change in height can have a major influence on the ecosystem. Maps of the arboretum grounds are located within this cache along with a log and small trade items. Please feel free to take and keep one of the maps. If the maps are getting low simply put this in the comments as you log your visit and we will restock the maps. Here is the beautiful entrance to the arboretum trails. Park in the UCF west parking garage, on weekdays remember to pay for your parking. This cache is part of the UCF Arboretum tour series. When logging your find please also include the number of people in your party and we also love to see photos of you or your group at play. We hope you enjoy the arboretum and learn something useful from the UCF Arboretum Geocache series.